Camping La Roche är en camping i Saint-Amand-Montrond, Cher, belägen vid en flod/ en bäck. Campingen har platser med stängsel, med skugga, utan skugga och platser med lite skugga. Det finns möjlighet att hyra tält och bungalows. På campingen finns en lekplats och ett sportområde. Denna inspektör gör varje år ett besök på Camping La Roche och inspekterar campingen för ca 200 faciliteter och för andra förekommande punkter. Inspektören är en medarbetare från ACSI och arbetar inte för campingen. The site closed the day after we left and it was being closed down with us present. Toilets open by reception were very basic. Taps had been removed from outside sinks. Staff were friendly and showed us pitches suitable for our extra large camping car. Getting onto pitches was tight but the pitches were tidy and large. Situated alongside the canal, although the walk into the town seemed a long walk through housing areas. It was one of the cheaper sites but felt like you got what you pay for. A good spot for an overnight stop. Th elite is near to the local town Amand just a walk, or better, cycle along the river. The sites are set out to give a good deal of privacy. The facilities are basic but clean. Morning pastries were available by order and very good. WiFi was reliable on our site. There are several trees which provide good shade but also challenge satellite reception. Good value with ACSI card. Quite an old site with old facilities but well maintained. Unlimited free wifi at central toilet block. Trees low and awkward for motor homes. No motor home service point so we were directed to an aire in the town. Okay for one night if nothing else available. We have stopped at this campsite on route to Spain for the last four years,we find this site easy to access from the motorway and is an ideal location for a overnight rest.We have found all of the staff to be very friendly and most helpful,the site is very clean and with in walking distance of the town.We will be using this campsite again in the next few weeks on our annual trip to Spain. A nicely positioned camp site but the facilities are in desperate need of updating. The ladies showers are barely usable I'm afraid. When the toilet brush holder consists of an old plastic drinks bottle cut in half you know things are pretty basic. An overnight stop on way back to Calais. Clean site with reasonable size flat pitch. Some hedging for privacy. Toilet and shower old but working and clean. Only downside is gate officially only opens at 8am so not great for an early getaway (although it did open at 7.15 am on the night we stayed). Vill du boka campingen Camping La Roche eller få mera information? Det går bra med nedanstående uppgifter eller via campingens webbsida. 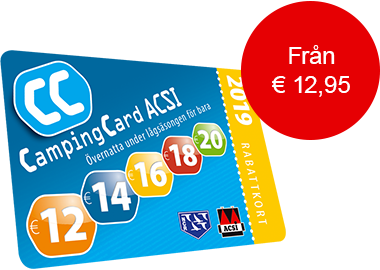 ACSI Eurocampings skickar din informationsförfrågan till "Camping La Roche".